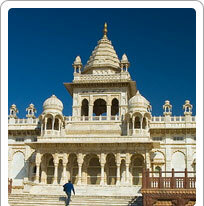 Jaswant Thanda is a memorial to the popular ruler Jaswant Singh II (1878-95). He cleansed Jodhpur of dacoits, built irrigation systems for the betterment of the public and boosted the economy. The Jaswant Thanda is situated on the road that leads up to the Mehrangarh Fort and is the best place to click stunning photographs of the Fort. As Jaswant Thanda is the crematorium of the Jodhpur royal family, there are cenotaphs of other members of the royal family as well. It has ornamental gardens, marble chattris and carved pillars adding to its beauty.